Day 01 : Arive Delhi. Day 02 : Delhi - Rishikesh. Leave for Rishikesh which is 226 kms - 6 hrs. Means the "Plaits of the sage". It is said that a great sage, Raivya Rishi meditated among the mountains where he saw vision of God. It is an altitude of 365 meters on the right bank of the Ganga and today it has become a centre of learning and research in yoga and meditation as an instrument of Mental & Physical health. Sightseeing in Rishikesh. Later drive to Shivpuri. Shivpuri - An experience by itself - with idylic surrounding gushing pure waters of the sacred river Ganges in forested hilly area and white sandy beaches- A truly unparalleled holiday. Overnight in Shivpuri. 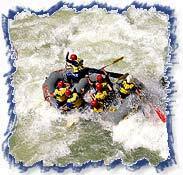 Day 03 : Rafting from Shivpuri to Rishikesh. Day 04 : Rishikesh - Delhi. Day 05 : Delhi / Back to home.